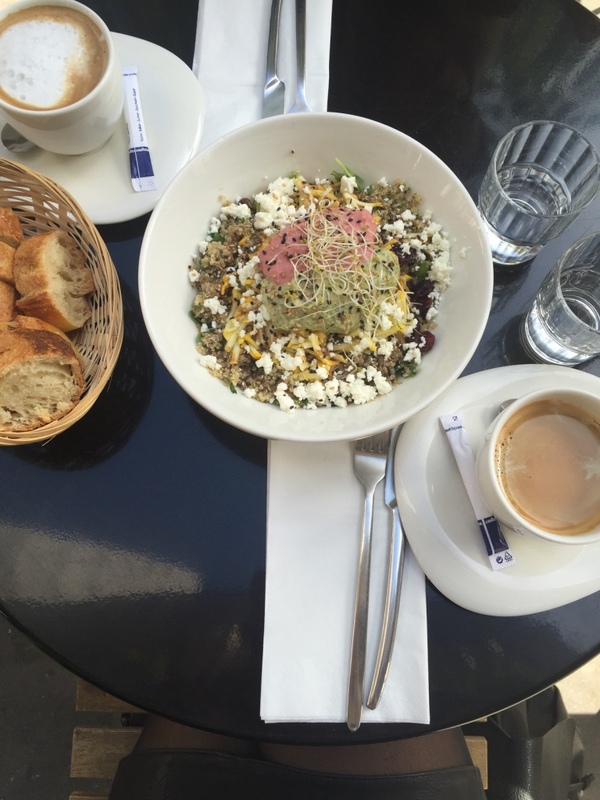 Whether you're a Paris local or just visiting, this guide guides you through my favorite lunch places in the city. No matter if you want to spend a bit more or a bit less money, if you want to go with friends or with your parents, I'm sure you'll find something matching while reading this post. Quickies. Everyone knows them. You grab a sandwich, a salad or anything similar, eat it in 10 minutes and that was your lunch break. Well, not in France, where people actually celebrate food and the act of eating. You can observe this especially in Paris, where all restaurants and bistros are packed during lunch time. People take their time, eat a proper two course meal, enjoy a dessert and a coffee and after an hour they head back to work; full of energy and full of inspiration (at least that's how I feel after a truly Parisian lunch; or bed...yes a little nap after these lunches can be a great thing, too!). Of course this isn't true for each and every single inhabitant of that city, same as it's also not true that all Germans constantly eat sausages and potatoes (well, some do). 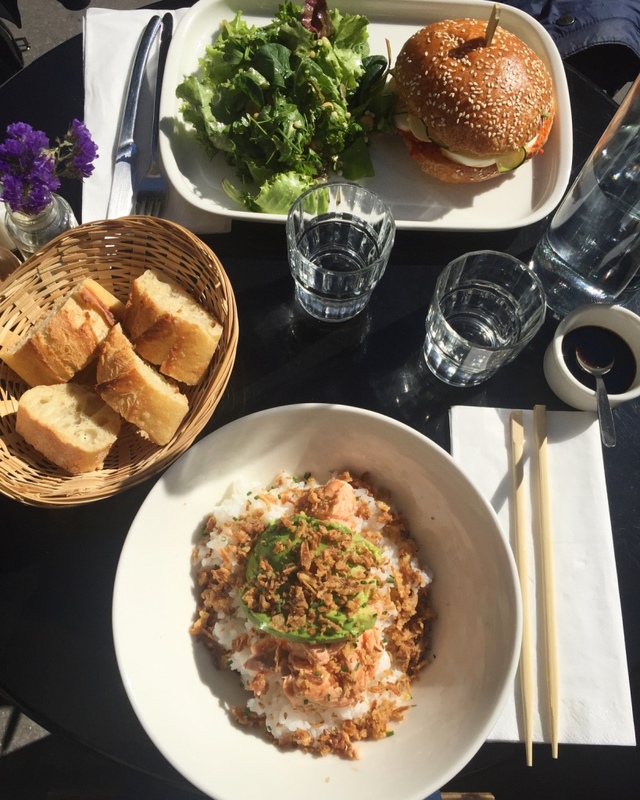 Anyways, as a student I had some free time during lunch, which made it easy for me to try several places around town; no matter if located in the 18th, the 11th or the 5th arrondissement. 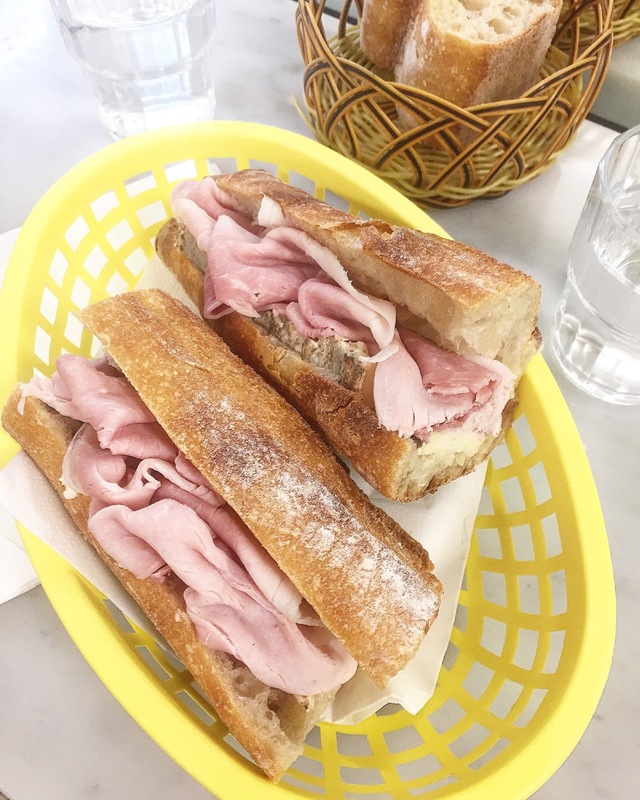 And of course I want to share my favourite ones with you, as I did already with my favourite brunch spots and my favourite wine bars, a few weeks ago. So here's a little list, featuring 16 lunch places I think are worth eating at. Some are more expensive, some less, some are perfect for a lunch with your student colleagues, some are better for a calm déjeuner with your parents. I'm sure there's something for everyone. I am happy about any (positive and negative/constructive) comments!! A medium sized restaurant, with a country house style interior, serving French food. Sometimes you'll find tatar on the menu, sometimes it can be fish or chicken. There is always a vegetarian option and the menu changes every day. I went there twice and have always been satisfied with my choice. This was stuffed poultry on creamy mashed potatoes once and a crispy veggie lasagna the second time. It's located just a few steps away from Canal St Martin, so either have a coffee here or at one of the many lovely cafes nearby. You can choose if you want to have the main course only and coffee (14€), two courses (19€) or three courses (21€). Price Range: 14-26€ for lunch and wine. Very crowded during lunch time, so I was glad I had made a reservation. This is also a very French place with many business women and men coming over for a lunch meeting or break. They have a menu to choose from and regular dishes, too. It's a place to come with your parents, but also for a relaxed lunch with friends. The waiters are stressed but nice and the interior is very brasserie-ish with a lot of dark colours and big, red, comfy sofas. I ate tender poultry with pumpkin puree and a delicious sauce. Price Range: lunch menu 22€, you can choose from 2 dishes. I waited with trying this one until one of my last summer days in Paris and my lovely roommate's last day in this charming city. The starter was a citrus fruit salad with feta and cilantro and as a main she had mashed potatoes with ox cheeks in its own sauce and I ordered a kind of ceviche with bulgur. 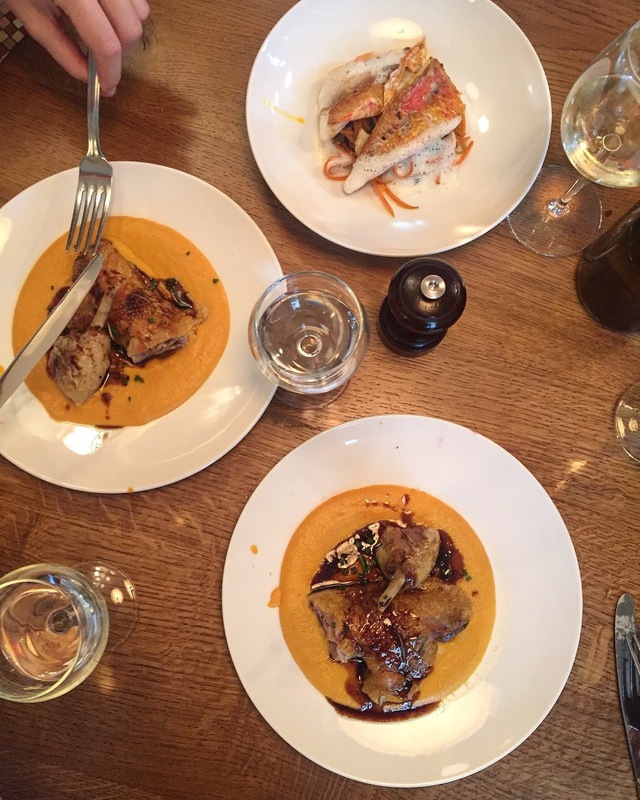 This place is very French and therefore you can find traditional dishes on their menu everyday, ranging from tatar over confit de canard to fish. 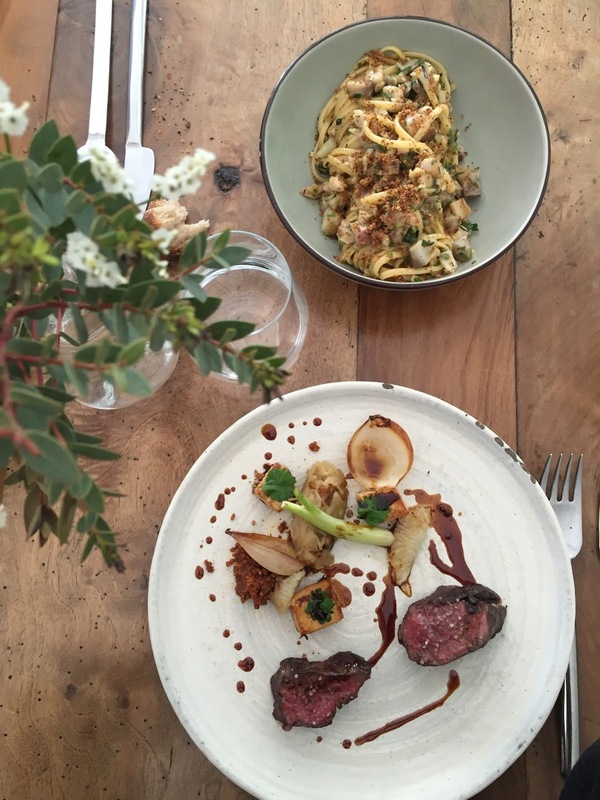 Dishes are not arranged in a super fancy way, nor do they include some experimental ingredients, but what you find here is truly good, homemade, French cuisine. The interior is very rustic, traditional and charming, waiters are very friendly. Price Range: 16€ for main and starter or dessert. This is a place truly reflecting life in Paris. Busy, hectic but full of charme. A two course meal is 18€ and three courses are 19€ (yep, also had to do the math twice!). I went here with my father and sister when they were visiting and I think the place is perfect for such occasions. It's very French, the waiters are very French and the food is, too. They serve delicious meat, fish and seafood. I had a tuna tatar as starter and continued the lunch journey with grilled octopus, just to finish it later with some cheese and meringue, brownies and ice cream. 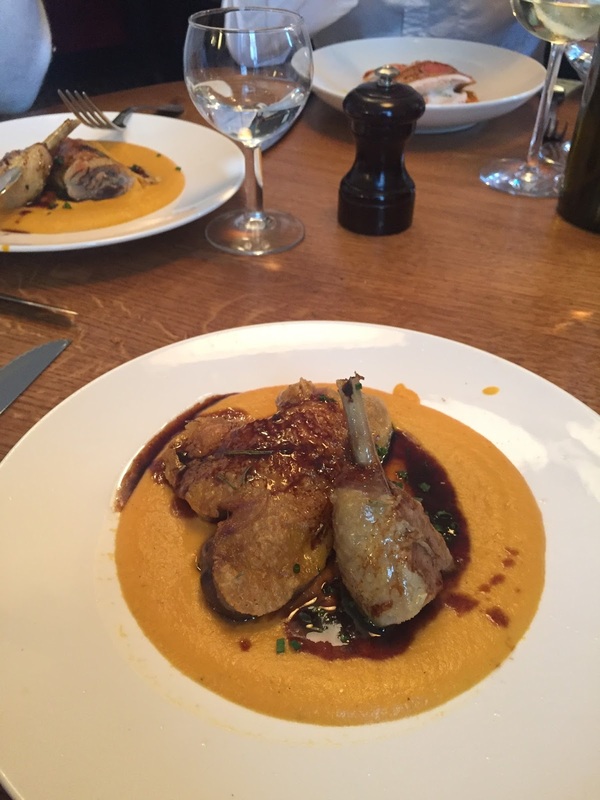 My sister had mushrooms in a white foam as starter and duck with shallots in red wine as main. Could it be better?! Price Range: 15-19€ for main and starter and/or dessert. A little restaurant serving food from la Bretagne, the Western part of France. Galettes (savoury crepes) and sweet crepes go perfect with a glas of apple cider. It's in the 15th arrondissement, not far from the Eiffel Tower, but far from being touristy. It's run by a very lovely and friendly couple. 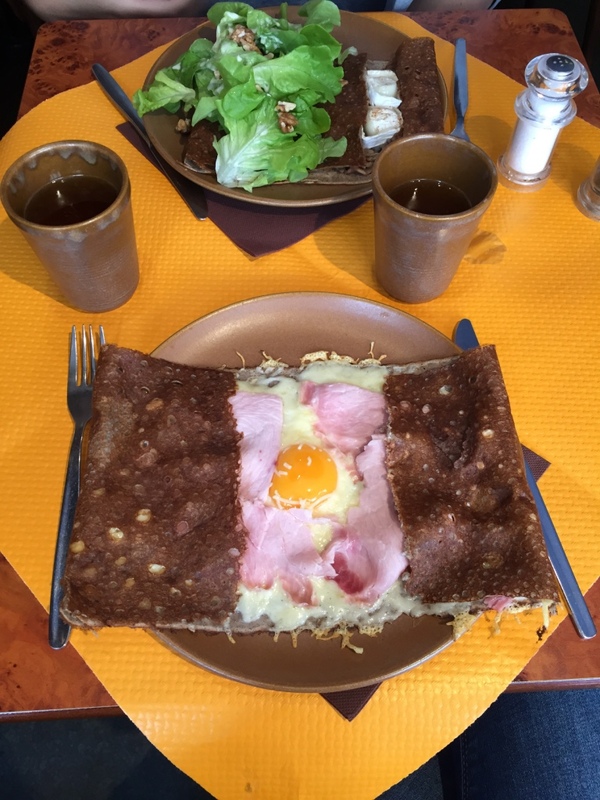 Price Range: the lunch menu is 12,90€ including a salty and a sweet crepe as well as a glass of orange juice, apple juice or cider. My favourite one so far. This one is a one star restaurant and absolutely worth the reservation hassle. You have to make a reservation 2 weeks in advance and spots fill up quickly. I got one because of a nice coincidence and was more than happy about it. 3 courses are 32€ and 6 courses 60€ for lunch, which is not a lot considering this place has a Michelin star. The waiters are very nice, very attentive, though not pretentious nor bothersome and they are happy to explain each ingredient several times, if you haven't remembered everything the first time. The interior is chic, but also kept rather simple and is not at all pretentious. I went here with my father and he enjoyed it as much as I did. The ingredients are very fresh, full of taste and seasonal. We chose the 6 course menu and what we got was (and sorry if I miss an ingredient): 1. type one oyster with toasted buckwheat and a cherry in a bouillon sauce 2. poached courgette with elderflower butter and almonds 3. turbot, grilled asparagus, artichoke in a tarragon-garden sorrel sauce 4. pigeon with a piece of liver (a dream!) little potatoes, wild asparagus and sea vegetables (absolute highlight!!) 5. honey-lime tree ice cream with a rhubarb compote and 6. yoghurt with orange zest and crumble/granola. Price Range: 32€-80€ for 3-6 dishes and wine. Simple, stylish, understatement interior with not too many tables (make a reservation) and daily changing lunch menus (two courses are only 15€; they are pre-selected), but also a range of other dishes to choose from (regular prices). 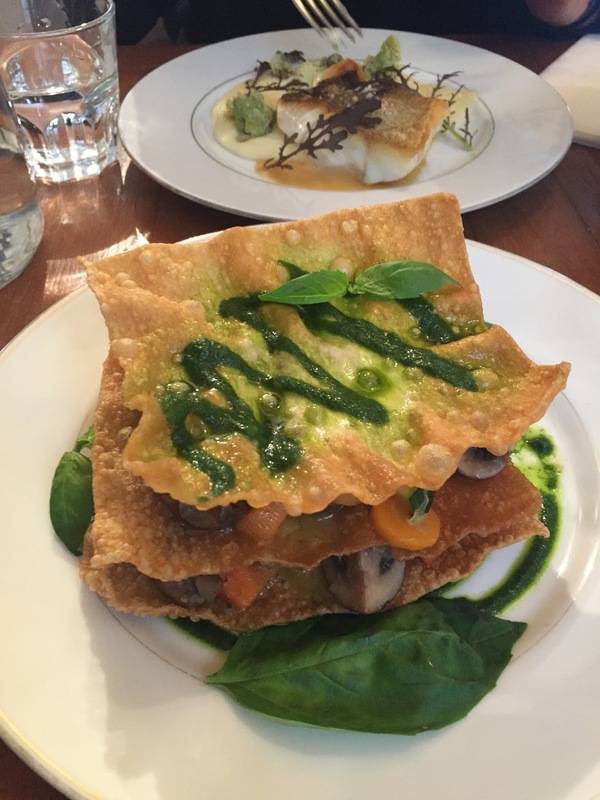 When I was there we had a delicious savoury pain perdu (french toast) with herbs and nuts as starter and fish with mashed potatoes, spinach and different seaweeds in white foam that I don't know was made from, but tasted great! Price Range: 15€ for main and starter or dessert. Very lovely and nice interior, all white-ish and wooden-ish (seems to be the norm in many Parisian restos currently) but with an individual touch. Very friendly and attentive, authentic Italian waiters, who lipread all your wishes. It's one of these places where you just want to stay at for hours and enjoy your many lunch courses (or dinner). Our starter was bruschetta soaked in a delicious sauce served with fish and for main my friend and I shared linguine with mackerel & beef with grapefruit, dried fruits and fennel. The coffee at the end was very Italian, served in beautiful little cups, which I would like to have at home myself. Price Range: 15-19€ for main and starter or dessert. 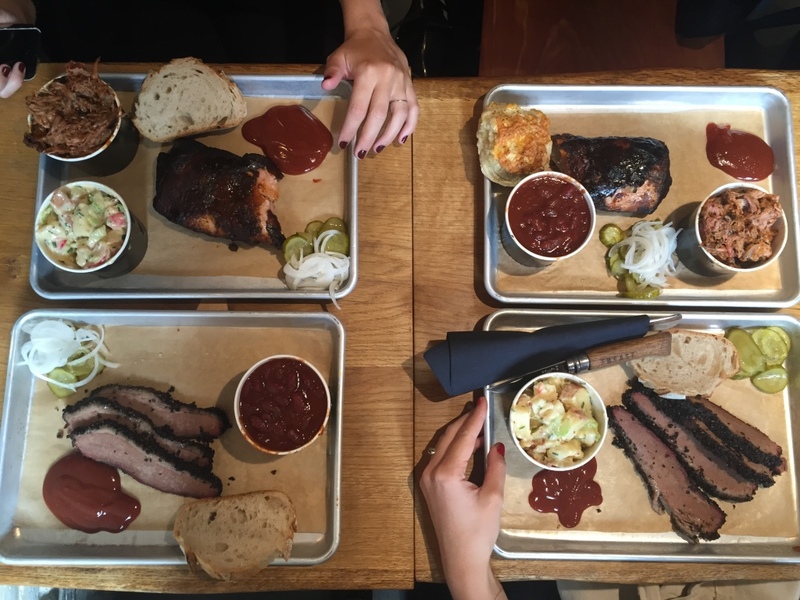 This Texas BBQ place serves delicious, tender, slow cooked meat in a slightly hectic but friendly atmosphere. 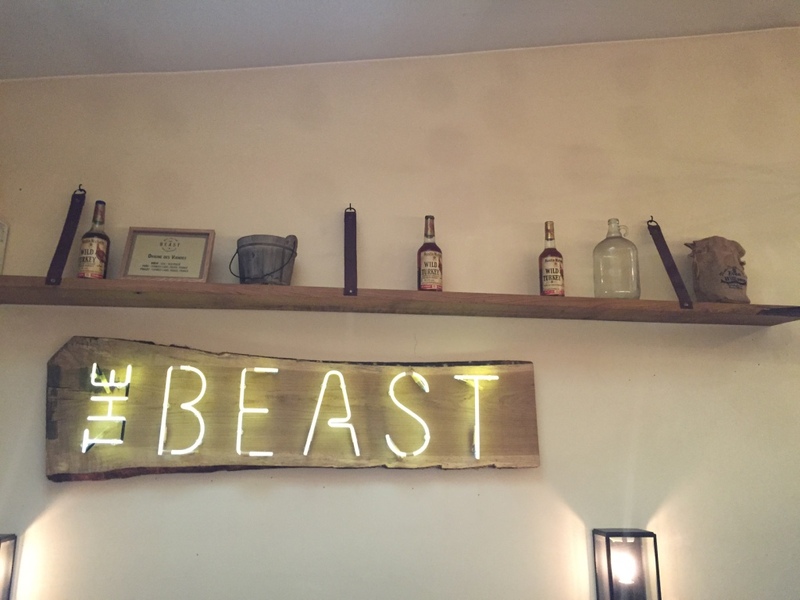 The beef brisket, the pulled pork and the baby beef ribs are to die for and my favourite sides are the BBQ beans, the braised kale and their homemade cheese scones. Needless to say, as a BBQ sauce lover, I loved their BBQ sauce. They also have all kinds of beers and homemade lemonade. Price Range: lunch menu for 15€ including 1 kind of meat, one side and a drink. This one is great for lunch with friends. You can choose between different burgers and sides - I had the beef burger and sweet potato fries - and enjoy your lunch while you sit on some kind of barstools; not super comfy, which is why I recommend it for a visit with friends rather than with parents. The burgers are delicious and the meat is served on steamed Asian buns. It can get crowded, but normally there is not much waiting time during lunch. Price Range: around 15€ for a burger and side. The name reveals everything. My two lunch companions went for a pastrami sandwich, which looked good and I had the Shakshuka together with two merguez sausages. The place looks nice and was calm, but is probably more vibrant during the evening. From here you can have an easy walk to the Opera and Galleries Lafayette. 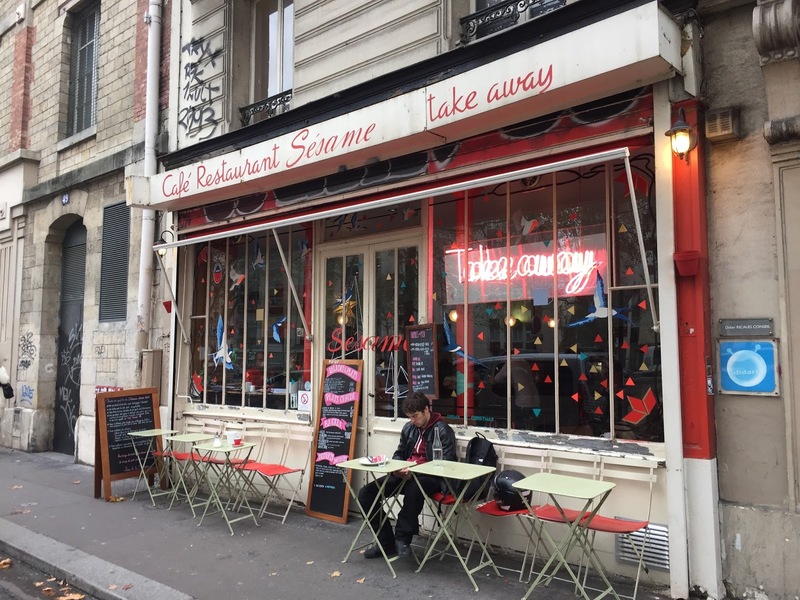 Located next to the lovely Square Trousseau in the 12th arrondissement, close to Bastille, this place is only serving lunch. All their dishes are vegetarian and quite creative. You can sit outside or inside and if you wish to have a second dessert, you just have to walk down the street to blé sucré, a nice French bakery, which is famous for their tarte tatin. Just sayin'. I've mentioned this place already in my brunch to-do list and here it is again. Not only is their staff very friendly, but you also get a full lunch (soup and main with salad) for around 12€, which is unbeatable. You can choose from two soups and two mains, which are prepared freshly every day from seasonal ingredients. 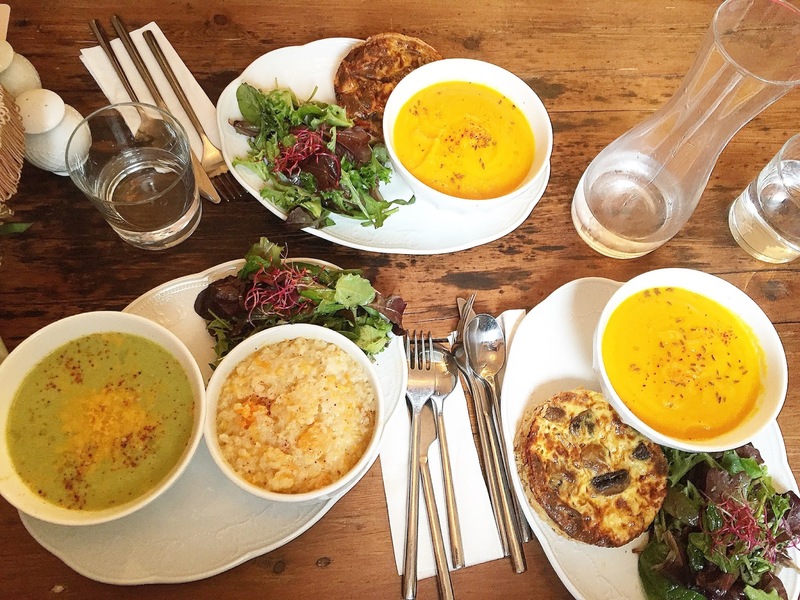 I had broccoli cream soup and pumpkin risotto, the other two meufs had carrot cumin soup and a champignon quiche. Price Range: around 12€ for main and starter or dessert. A Portuguese small eatery in Paris. Not far from where all universities are, this is a nice spot to come to when having a spare hour between classes. You choose the way you want your chicken, the sauce and whether you want potatoes or fries with it (I guess salad might be an option, too). Last time I was there, we had to wait 10 minutes and our waitress was a bit confused, but food was good and I recommend their pastel de nata. Price Range: 8€ for 1/4 chicken and a side. This one is a quick to go place, but believe me, you won't get any better sandwiches in Paris than you're getting here. Super crispy on the outside, fluffy inside and their fillings are fresh and change frequently. You can simply go with a ham sandwich, which already is great, or have a tortilla, chorizo, roast beef, or whatever you please, in it. The only thing is that lines can become long and if you're too late, there's not much left of the daily menu. Price Range: sandwiches are between 4-8€. You can't miss this place. It's located at Canal St Martin and you'll immediately recognize the pink flashing sign welcoming you. 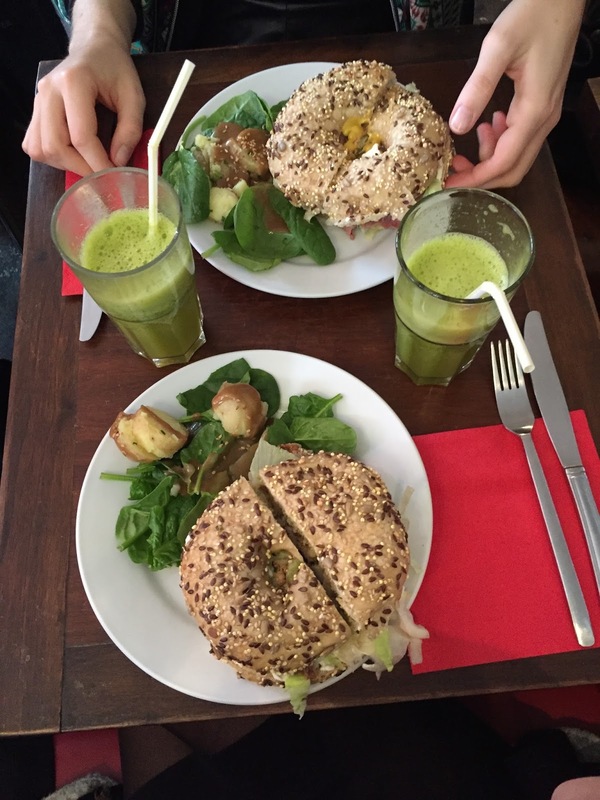 The cafe is rather a deli, serving salads and all kinds of bagels. We had a roast beef mustard and a goat cheese and duck one, but they have plenty of other creative combinations. A fresh smoothie is included in the lunch menu. These are some of the places, which are still on my to-do list that I desperately want to try some day!